Thor investigates an alien fleet passing through Earth’s solar system at the behest of SHIELD’s director Nick Fury. 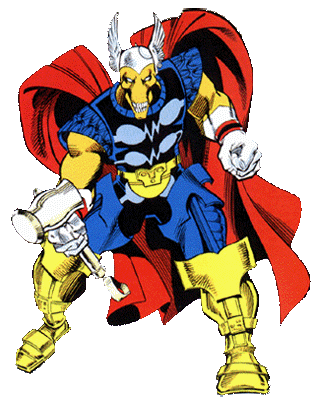 The advance ship identifies Thor as a threat and awakens Beta Ray Bill from suspended animation. The pair battle for a standstill until the ship reaches Earth’s orbit and Thor transforms back into Donald Blake after being separated from Mjolnir for more than sixty seconds. Bill picks up the cane and strikes it on the ground, transforming into a new alien form of Thor. Skuttlebutt, the name of the advanced ship, arrives on Earth. Bill easily dispatches a SHIELD strike team before Odin arrives and retrieves both his son and Bill to avoid further conflict. Bill tells the Asgardians of the story of his race, the Korbinites. They were almost rendered extinct when their galaxy exploded. Those that remain fled in a fleet of ships with the sentient Skuttlebutt acting as the stadnard bearer and Beta Ray Bill being their champion. Bill was augmented using Korbinite science and no longer resembles his kind for a gift of greater strength and durability. Odin proposes a battle to the death in Skartheim to decide who will wield Mjolnir, Bill or Thor. Bill and Thor battle each other to a standstill once again, knocking each other out. Bill, thanks to his augmentation, is able to recover first. Though he is declared the winner he also saves Thor from falling into lava and perishing. Bill wants Mjolnir to protect his people but respects Thor’s warrior spirit. To solve this issue, Odin has a new hammer forged from the same Uru as Mjolnir: Stormbreaker. Odin crafts an enchantment onto Stormbreaker that allows Bill to return to his original form and in the process removes Thor’s ability to transform into Donald Blake. Some time later, Surtur begins his siege of Asgard and sends fire demons to attack the Earth. Bill learns that Surtur was behind the destruction of the Korbinite’s home galaxy. Because of this, he joins the Asgardians in their defense of Earth while Thor, Odin and Loki confront Surtur in Asgard. Bill aids the heroes of Earth several more times against foes such as Dire Wraiths, Titanium Man, Kurse, Seth and the Juggernaut. He also forms a bond with Sif during these adventures. Bill remains a loyal friend of Thor and Asgard, battling Tyrant as well as helping to hold back Thor’s “warrior madness.” Bill later is a founding member of the Thor Corps in their battle against Demonstaff. He continues to aid the heroes of Earth against the Kree, Shi’ar and Z’nox. After Thor brings about Ragnarok, Bill visits his people’s new homeworld. Once there, he is attacked by his insane predecessor, Alpha Ray. Bill is able to overcome Alpha just in time for Galactus and his herald Stardust to arrive. Bill tries to repel Galactus but ultimately fails and is almost killed while Galactus consumes the world. Bill is left drifting through space until he is found by Skuttlebutt and together they recover an orb containing numerous Korbinite souls. Bill visits the desolate Asgard and allies with Stardust to battle Asteroth. This battle leaves Bill mortally wounded and near death. A strange entity arrives to heal him and claim the Korbinite souls in the orb. It then places Bill in the recently deceased body of war veteran Simon Walters on Earth. While there, he battles the Boar alongside Spider-Man. During the American super-hero civil war, Bill joins Omega Flight and battles the Wrecking Crew who have released the Great Beasts. Bill sacrifices himself and is trapped in another dimension with the Beasts, locked in eternal battle. Bill finds his way out of this dimension at some point and is captured by Skrulls who gift Stormbreaker to a Super-Skrull named Godkiller. Thor rescues Bill only for Loki to start a rumor that Bill is actually a Skrull. To prove his friend’s innocence, Thor throws Mjolnir at Bill, who easily catches it. Bill is nursed back to health and then, with Thor’s help, is able to defeat the Godkiller and retrieve Stormbreaker. It is at this point that Bill decides to hunt down Galactus and avenge the death of the Korbinites’ second home world and seeming genocide of his people. Bill has a brief battle with Stardust before the arrival of the Silver Surfer. The Surfer is confused by Bill’s futile quest and battles the Korbinite while Bill explains that he hopes to starve Galactus by destroying the worlds he would feed on. This crusade leads to Bill becoming unworthy of wielding Stormbreaker. Bill is undeterred by this turn of events and tracks down Galactus armed with an armory of alien weapons. When he arrives, however, he finds Galactus already under attack. In a moment of conscience, Bill decides to aid Galactus and saves the powerful being. Galactus is thankful for the help and creates a Korbinite mate for him. This act of kindness also allows Bill to again wield Stormbreaker. Bill is part of Nova’s team that travels into the Cancerverse. He is later recruited by Cosmo to join the Annihilators and helps to defend Galador from the Dire Wraiths. Bill later helps Thor attempt to retrieve a Mjolnir from another dimension from the Collector. Previous PostDrawlloween Day 31: Trick R TreatNext PostTMNT Munchking Unboxing!